The things we collect may seem like clutter & may not "spark joy" but they are part of our history, one that tells a story of where we have been & who we are. I am being Kondo’d. My husband has found his kindred spirit in Marie Kondo, the Japanese woman who has become a global phenomenon in tackling our collective obsession with stuff. He, like her, believes we should only keep the things in our home–be it clothes, books, anything really, that we love. 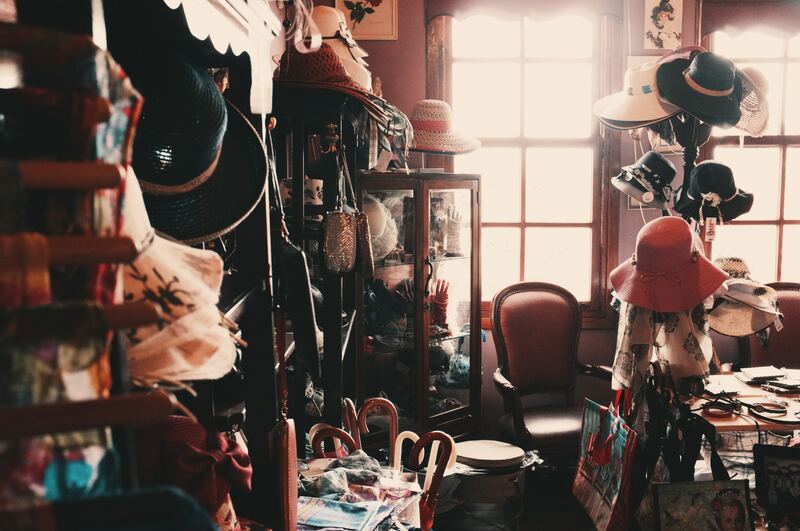 Her method, the KonMari Method, which has been trademarked, “encourages tidying by category – not by location – beginning with clothes, then moving on to books, papers, komono (miscellaneous items), and, finally, sentimental items. Keep only those things that speak to the heart, and discard items that no longer spark joy. Thank them for their service – then let them go.” Her website declares the success of her method is based on “being mindful, introspective and forward-looking.” I am not a hoarder, although I’m sure my husband will disagree, but I will admit, I am perhaps sentimental when it comes to choosing what to keep and what to get rid of. For me, my “stuff” is part of my history, part of my story–a reflection of who and where I was and am in my life emotionally. When they moved to Hong Kong, finding jobs wasn’t easy. While it was a time of growth for the city with so many having left China, more immigrants coming from India as well as expats from Britain, jobs were scarce and demand was high. Racism played a huge factor in employment in Hong Kong. My grandfather eventually found work as a security guard, a night watchman for office and apartment buildings. He went back to the basics, the work he did when he started out in Shanghai. There was no room for pride. It was a luxury they couldn’t afford. My mother found work as a secretary, giving up her dream of being a journalist. My uncle and aunt also found jobs to help their family. My mom still tells me of the pride she felt when she earned her paycheques and with her siblings, could afford to rent an apartment and buy things for the family. Everything they bought felt like armour, protection from feeling vulnerable again. Protection from being stripped of their home, their belongings, their dignity, and respect. My grandfather never really recovered from having lost everything he worked for, but he never showed it, not to me and my brother anyway. I just remember him always giving us pocket money from the plastic bag of coins he carried with him. But my mother could see what it had done to him, how reduced he felt. My mother felt the need to protect and keep all the things they bought together as a family. Not only out of fear of it all being taken away again, but also proof that nothing could destroy them as a family. And that feeling has never really left her. When we left Hong Kong in 1988, it was to protect all of us from what might happen to Hong Kong when China took over control in 1997. She didn’t want to go through what she went through 25 years prior when her and her family fled Shanghai. To this day, my mom still wears the sweaters she bought in Hong Kong to prepare for our move to Canada 30. I still hear her her old sewing machine whirring away in the basement when she’s down there mending things. She has her old typewriter from Hong Kong even though she uses a PC. She has kept the very first camera she ever bought from money she saved. It is a Pentax and she refuses to sell it. She has tons of papers/documents from decades ago, almost as proof through those papers that she and her life are legitimate, that no one could one day knock on her door and tell her none of it was hers. My mother won’t throw away anything that I or my brother have bought her. It’s part sentimentality but also part not wanting to waste money by throwing something out, something she might find use for again. It comes out of a respect for the effort it took us to get a job, to earn the money to be able to afford to buy something because while that rite of passage is normal for all of us, for my mother, it came at a time when instead of it being a natural progression into adulthood, it was a harrowing scramble to find a life raft towards stability. My father, brother, and I have tried to get my mother to get rid of things that she doesn’t need but to no avail. She has held onto those things for decades and now having lost her parents and her brother, her things are what helps keep them alive. Marie Kondo says in her book The Life-Changing Magic of Tidying Up: The Japanese Art of Decluttering and Organizing, “when we really delve into the reasons for why we can’t let something go, there are only two: an attachment to the past or a fear for the future.” For my mother, it is both. Attachment to what was, attachment to the loves of her life when she was growing up–her parents and her siblings, and fear of losing everything, fear of an unpredictable future. For my mother, her history taught her to be resilient, strong, purposeful, and independent. Her history, through her possessions, were proof of what she was able to accomplish. Do they spark joy in her today? Maybe not, but they are an important reminder of the woman she became. And those newspapers are a reminder of a woman who is still fiercely determined to learn new things, of a woman who was always busy keeping her family afloat, and of a woman who gave up her dream to be a journalist. That’s not to say that sifting through them and saying goodbye to those things that don’t serve any purpose anymore wouldn’t be cathartic for her. But as Arielle Bernstein wrote in her article ‘Marie Kondo and the Privilege of Clutter’, which was published in The Atlantic in 2016, “…for families that have experienced giving their dearest possessions up unwillingly, “putting things in order” is never going to be as simple as throwing things away. Everything they manage to hold onto matters deeply. Everything is confirmation they survived.” And for my mother, it is all confirmation that she thrived. I still have a sweater that my aunty bought and used to wear almost 50 years ago and a pair of pyjamas that my mother bought 40 years ago as well as countless cards, notes, scraps, knickknacks. I find it hard to throw away anything that my family has given me, even the wrapping paper in which it was given. And while he doesn’t keep much, my husband has his late mother’s scarf where there is still a whiff of the scent she wore. Do all these things spark joy in us? Not necessarily joy. For me, like for my mother, it is all a representation of the love, thought, and effort from the people that are the most important to me. For me, it is a reminder that I am loved, that I am someone to someone. And maybe because I live so far away from my parents, brother and his family, those things are ever-more important to me. And while the memories are there, it is in those things that we can see and smell that evoke a sense of belonging and lineage. A sense of history and family. Because while we are always thinking about the present and the future, it is our history that helps shape us into who we are and will become.